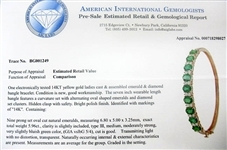 Lot Detail - 14K EMERALD AND DIAMOND BANGLE BRACELET 7.43 C.T.W. 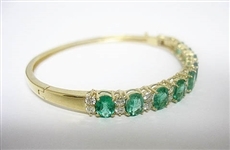 14K EMERALD AND DIAMOND BANGLE BRACELET 7.43 C.T.W. IN GOOD CONDITION. 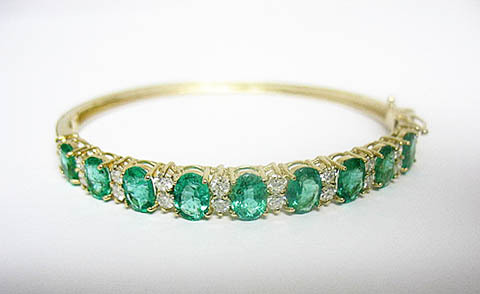 14K EMERALD AND DIAMOND BANGLE BRACELET APPROXIMATELY 7.43 C.T.W. COMES WITH OUTSIDE INDEPENDENT APPRAISAL THAT WE FEEL IS A HIGH RETAIL APPRAISAL. IT IS SOLELY FOR INFORMATIONAL PURPOSES ONLY AND IS NOT A GUARANTEE OF QUALITY OR VALUE. PLEASE BID ACCORDINGLY SINCE SALE OF THIS ITEM IS FINAL.